After gaining experience for six years in the field working for other people in the interior design industry, Pat decided it was time to go out on her own. 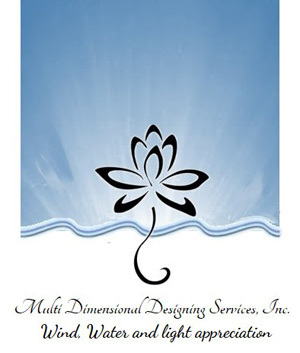 Twenty years ago she started her own design company called Multi Dimensional Designing Services, Inc. The name was picked strategically to be reflective of the many layers of subtlety and complexity that go into bringing an idea for creating space into form and fruition. 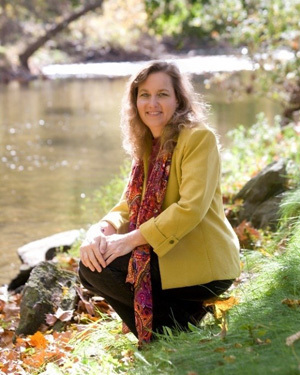 Pat has been a lifelong student for many years studying many philosophies and metaphysical studies as they relate to our life and the space we create to live in. 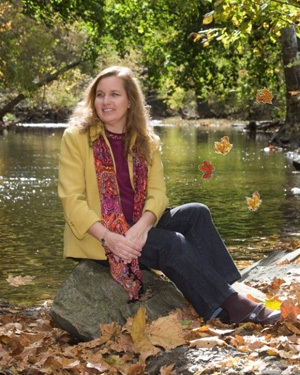 In her work she incorporates principles of feng shui, sacred geometry and sacred architecture synthesized with her intuitive ability to sense and read energy when working on any project to masterfully manipulate it for optimal results. Pat has been a professional member of ASID, the American Society of Interior Designers, since 2001. She is also a NCIDQ certified, number 016882, interior designer. 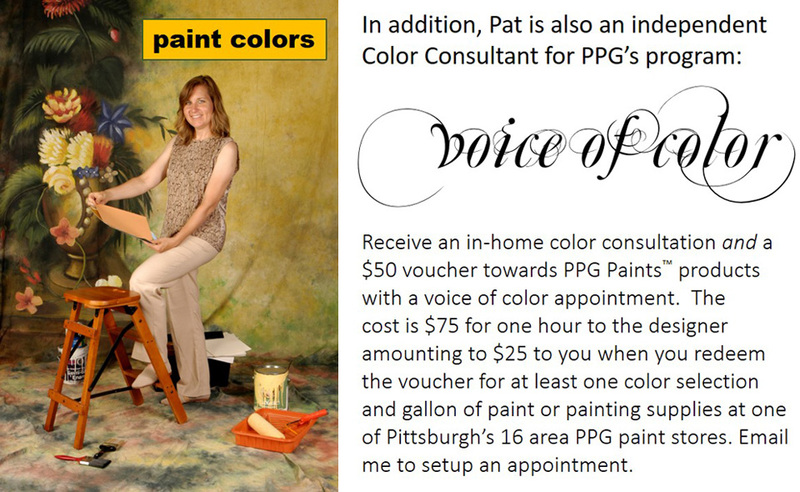 Pat is a graduate from the Art Institute of Pittsburgh. It is always a joy to work with clients and open up their world to new facets of design and refinement in their homes, especially when their living space has been totally morphed into new ways of making use of it by implementing my design suggestions for optimal function and energetic flow of the space. Because the before pictures aren’t displayed in the portfolio, it is hard to appreciate the magnitude of change that many of the finished projects have gone through. Here is an example of my work. 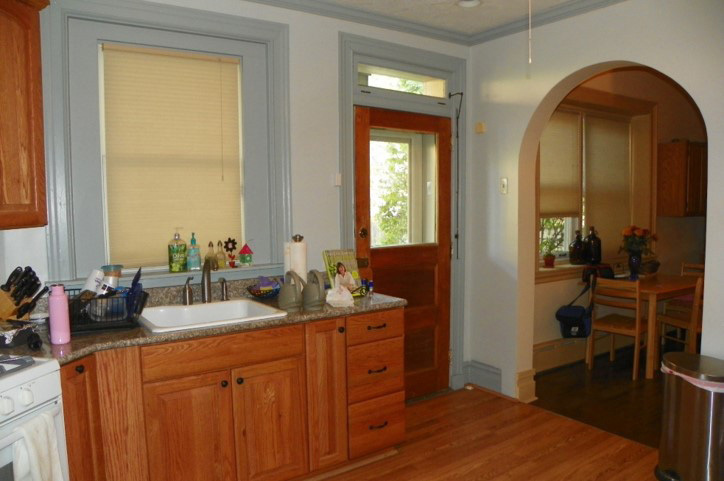 In this hundred year plus home in Shadyside, the kitchen had very limited space to work with, not to mention the wide radiator that chewed up lots of the space. 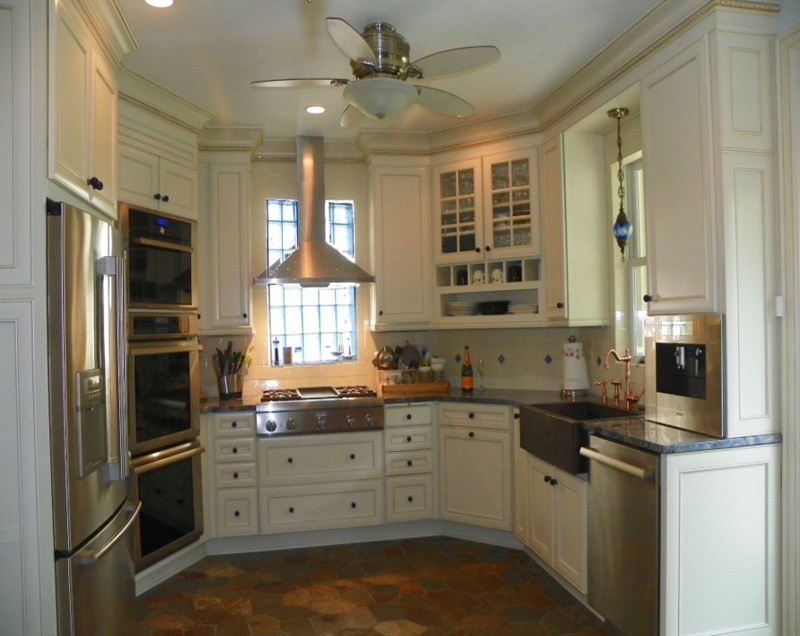 My client was very fond of cooking and spent much of her time in the kitchen making elaborate meals and desserts. 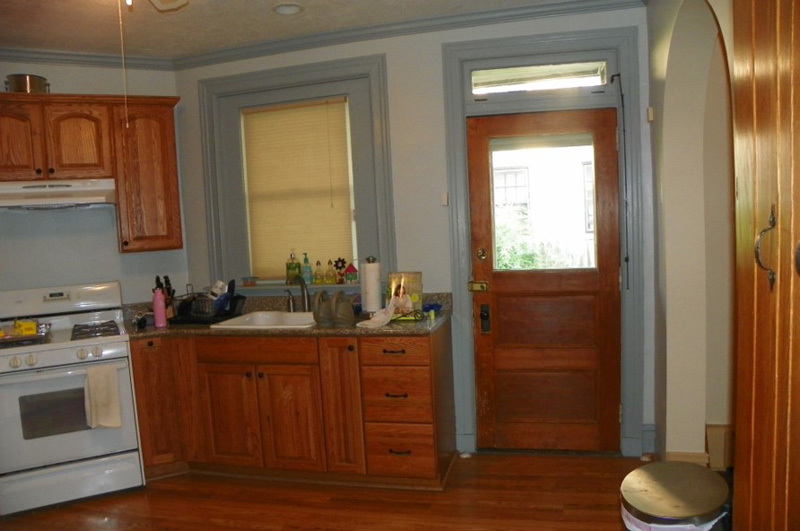 As you can see from her before photo, her countertops were filled with all her cooking tools and everything else because there just wasn’t a place for them. She felt like her hands were tied and was frustrated with the lack of organization and preparation surface. 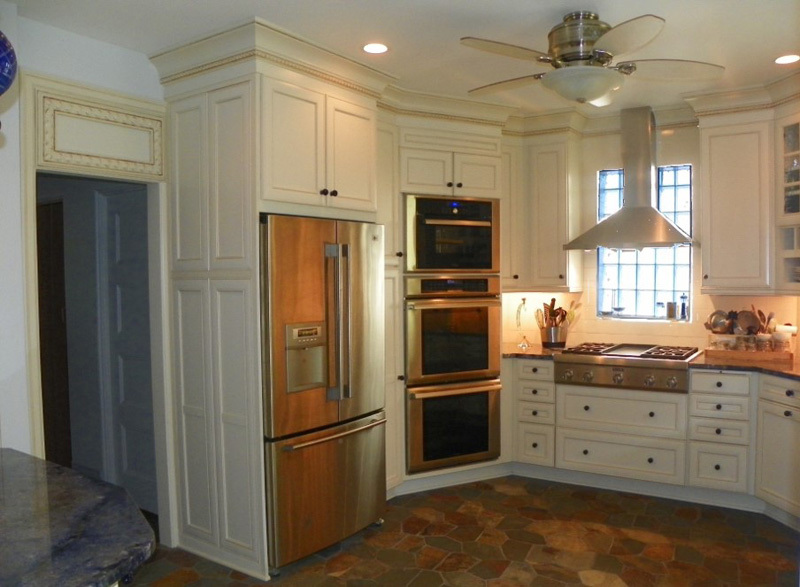 In order to accommodate two ovens, that was my client’s dream, along with along with a combo convection and steam oven, I reworked the guts of a tall appliance wall cabinet to fit all the ovens. I needed more wall space to accommodate a wider four burner plus grill cooktop and needed to change the location from the stove’s previous placement. In order to accomplish that, I eliminated the radiator and replaced the heating source with a special heat producing ceiling fan. I put glass block in the window to make the area more functional and to serve as a unique backdrop for the stove lighting and ventilation. 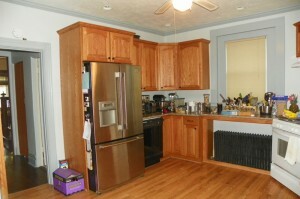 I had to maximize every inch of space that I could muster for this kitchen. The wide casing around the window and door was using up a lot of useable wall space. The arched doorway you see off to the right was removed along with a portion of its wall to open up more area for an island and create an extended area for the kitchen. By using narrow window and door casing, I was able to widen the useable space along the wall to accommodate a dish washer to the right of the sink instead of inconveniently across the kitchen and still have the sink centered with the window. The increased wall space also allowed a spot for a very special coffee and cappuccino maker built in on the counter that my client’s say was better than Starbucks!!! I took all the cabinets up to the ceiling to maximize storage space. The “before” dining room next to the kitchen was very roomy. The angled wall that the fireplace was on rendered an area behind it that made a perfect spot for my client to put in a pantry. In order to carve out room in the kitchen for an island, I needed to take some space out of the dining room. My solution was to create another angled wall in the dining room to balance out the existing angled wall and contain an opening within it into the dining room. 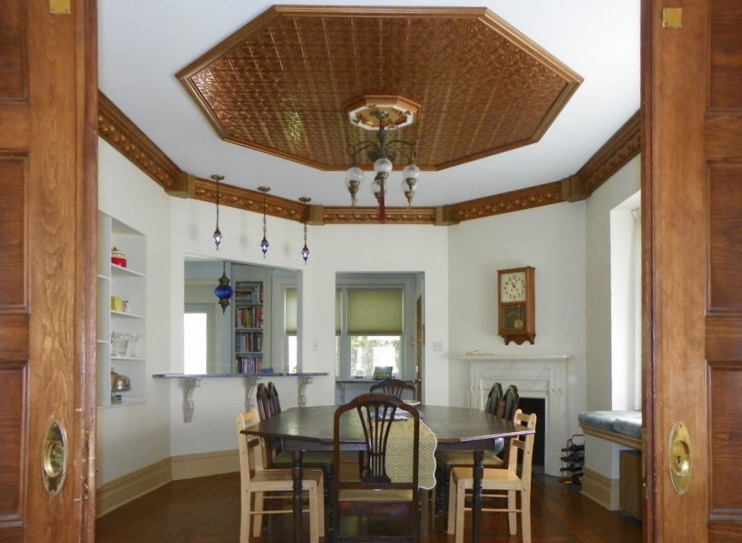 The dining room is now balanced visually and the new shape is further defined with the ceiling application. There is also room for bar stools to be added under the extended bar height countertop opening up both rooms to set the stage for entertaining a lot of people. The kitchen was too small to have a table in it. 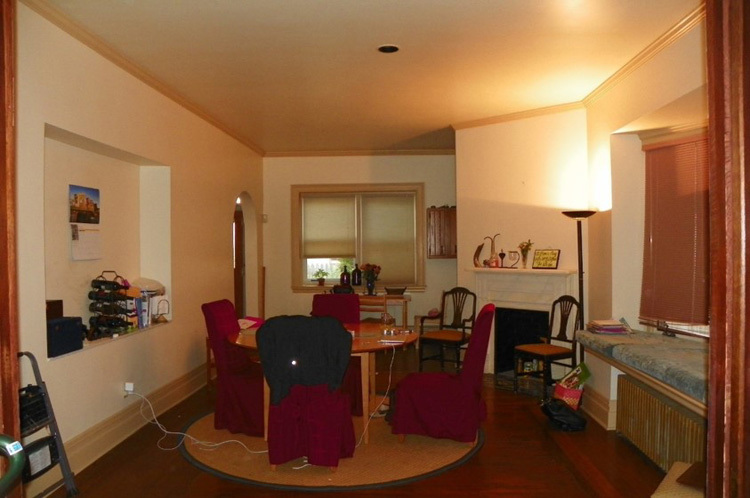 A small kitchen table was also contained in the dining room. 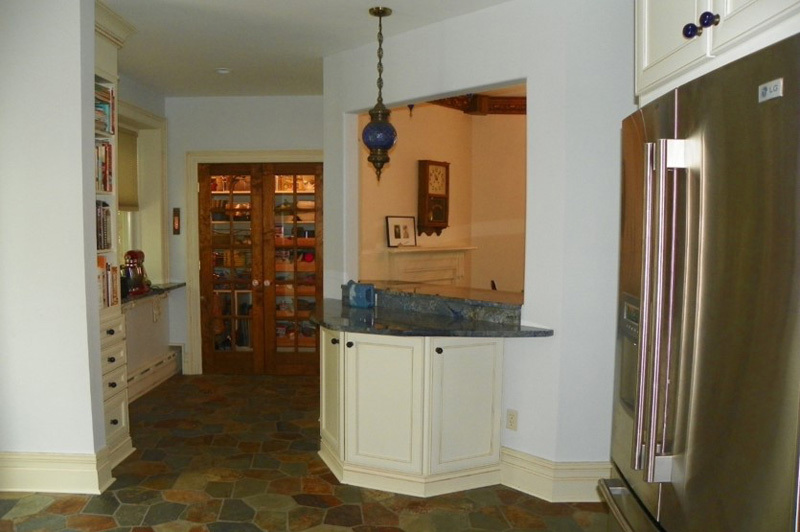 The arched doorway was removed in addition to some of the wall to open up the kitchen for an island in the kitchen extended to the dining room. Along the window an additional counter surface was added. Pat also loves to create from within imagining new ways of creating a design or a custom piece instead of just looking for something that exists. Making something on her own is another area that is a labor of love; handcrafting and building from her garage turned wood shop is a common thing for Pat. Color is the of expressing personality, atmosphere, emotion, and spaciousness. Color is affected by Light and can create a feeling of sound. Colors are the building blocks and magic tools of our tangible reality with endless possibilities. Color is energy and creation in motion. Color, shape, and proportion are the essential trinity of expressive design laid out in the architectural foundational. Color is a key component in the creation of a space. It is also a fascinating art form to work with. It can evoke emotion and create the feeling of space. It is heard as the “Voice of Color”. I have witnessed countless times the dramatic change just changing the wall color in a home can bring.